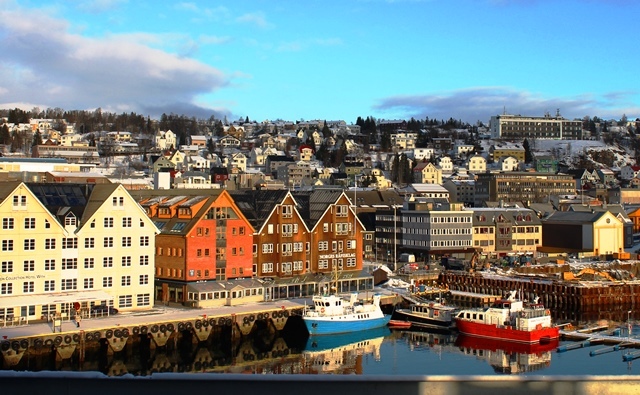 Protected by undulating, snow-covered mountains, surrounded by icy waters, fjord-safe and imbued with exploration history, Tromso (Tromsø) has a maverick feel to it that gives an exciting edge. 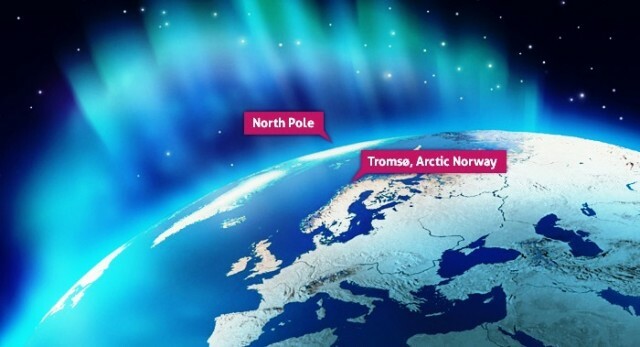 Situated 150 miles into Arctic Norway, Tromso is the capital of Finnmark region, named after the Finns or Lapps who have lived in this area for centuries. Ships have shuttled between here and Russia and it was a major centre for polar bear, whale, seal and walrus hunting. In tribute to the many who made their living in this way, there’s a huge statue of a whaler overlooking the spectacular harbour and beautiful bridge. Given its geographic position, it’s not as cold as you might imagine. The average January temperature is -4°C with plenty of snow to add to its attractiveness. 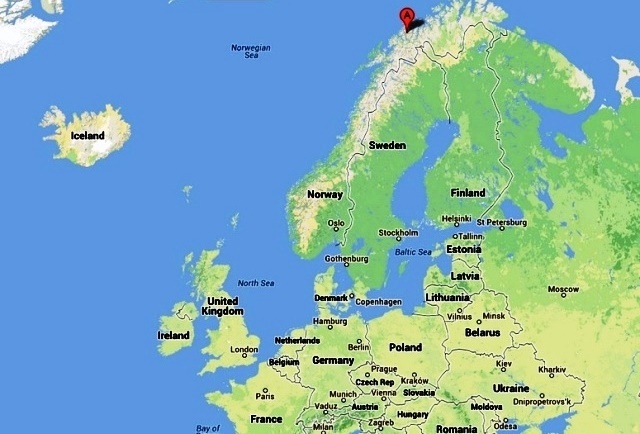 A relatively small town in European terms, with almost 70k inhabitants, it’s one of the largest in this isolated part of the world. 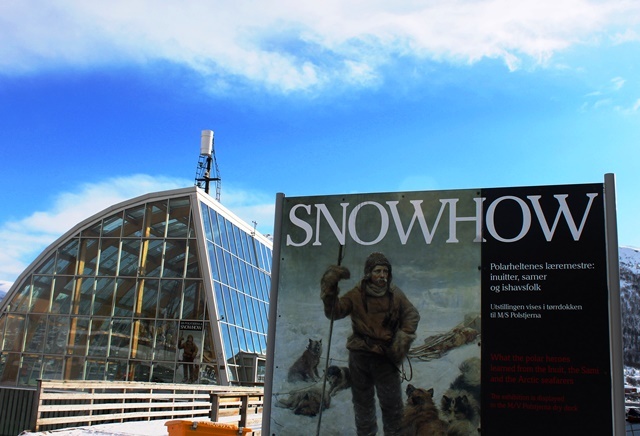 Many Polar expeditions set off from here. Famous Norwegian Roald Amundsen left from the town to rescue fellow explorer (and competitor) Umberto Nobile, in a seaplane. Roald didn’t return. 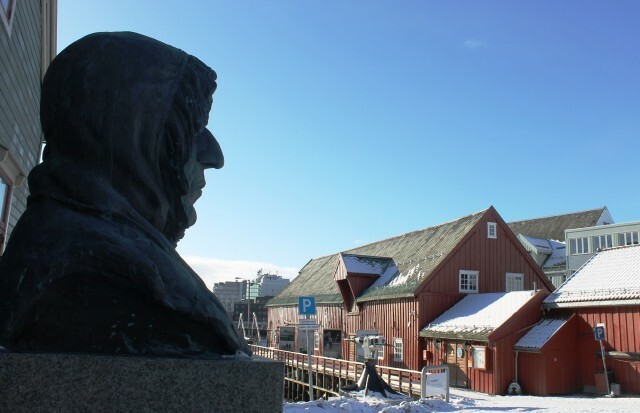 I visited Tromsø¸ in March, joining the Hurtugruten ferry ‘Richard With for a magical voyage along Norway’s impressive coast to Europe’s most northerly point and Kirkenes. 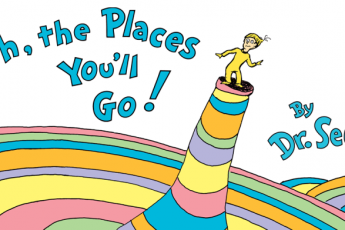 I spent an evening and day wandering its pavements, some of which are actually heated to prevent icing. (It was VERY slippy; I tumbled twice so if you go in winter make sure you have boots with a good grip!) 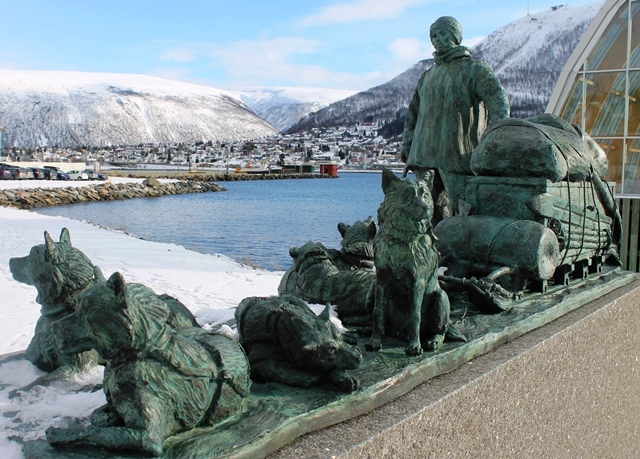 Here are 3 things to do in Tromso which give a glimpse inot the challenging life of Arctic Norway. The Polar Museum (Polarmuseet) 0n the harbour front in ‘Old Tromsø’, is housed in the former Customs House, a red-painted wooden building that has survived since 1830. 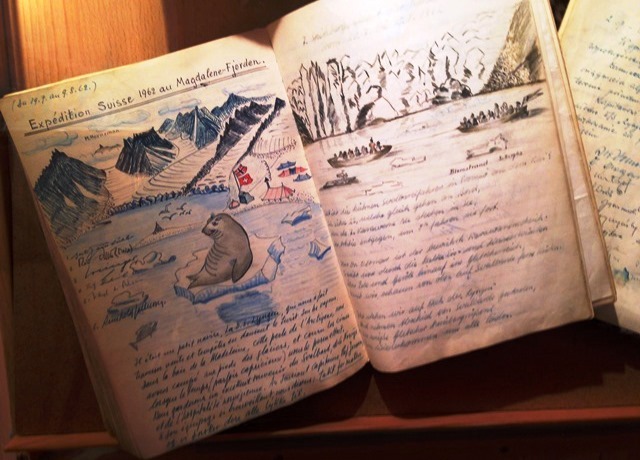 It is crammed full of intriguing exhibits from Polar life and sea-faring adventures, including equipment, itineraries, maps and beautifully illustrated journals. I was particularly intrigued to see a very chic fur coat belonging to Wanny Woldstad (1895-1959), the first female trapper to spend the winter in this region – and the town’s first woman taxi-driver. 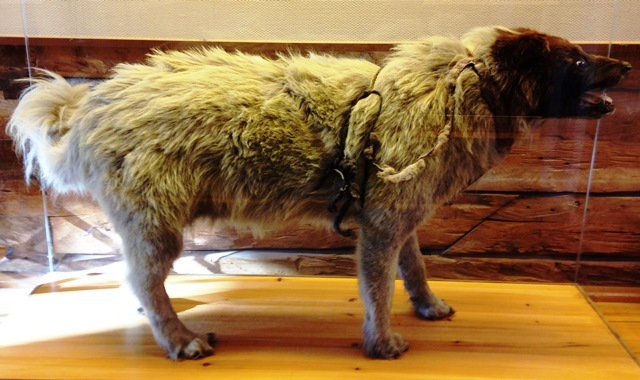 There is plenty about Fridtjof Nansen‘s and Roald Amundsen’s lives and expeditions, including the stuffed dog Amundsen took with him to the South Pole. 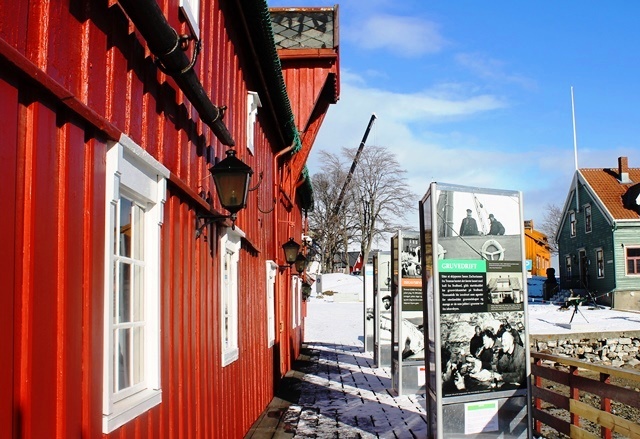 Opposite is the Amundsen Museum and the area has ship-building yards, old warehouses and other historic wooden buildings set higgledy-piggledy around the harbour. 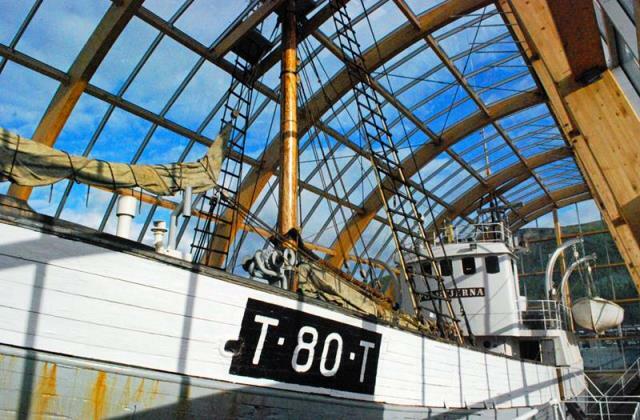 Built in 1949, MS Polstjerna (Polar Star) was a seal-hunting ship and is now preserved in a state-of-the-art glass-covered exhibition space. With light refracting from the surrounding mountains and icy waters it’s easy to imagine this doughty vessel slipping its moorings and setting off down the fjord and into the open sea for one last adventure. Next door is Polaria, a great place for all ages to find out more about this unique area of Norway. 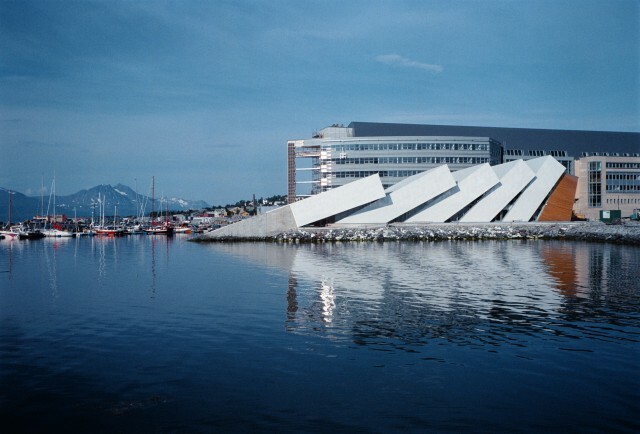 This striking building represents ice floes that have been pressed up on land by the rough seas of the Arctic ocean. 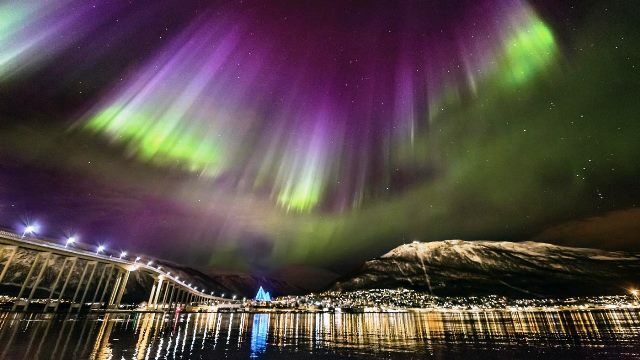 However, if you’re unlucky, like me, or there at the wrong time of year, then you can get the next best thing by going to the panoramic cinema and watching Northern Lights in Arctic Norway which explains how the aurora is formed, with stunning photography by Ole. C. Salomonsen. In the other film showing here, Svalbard – Arctic Wilderness, a little auk takes viewers on a helicopter flight along the coast of Spitsbergen, the largest island in the group known as Svalbard. Without doubt, the most uplifting experience I had during the Hurtigruten cruise was the midnight concert at the Arctic Cathedral in Tromso. 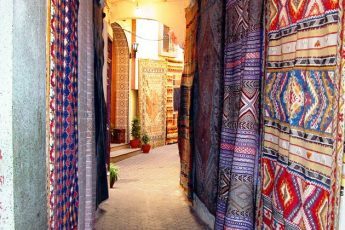 You can read about it in this article by fellow travel blogger Kathryn Burrington. We stayed in the uber-contemporary Scandic Ishavshotel and from my huge bedroom there was a great view of the old harbour and town. 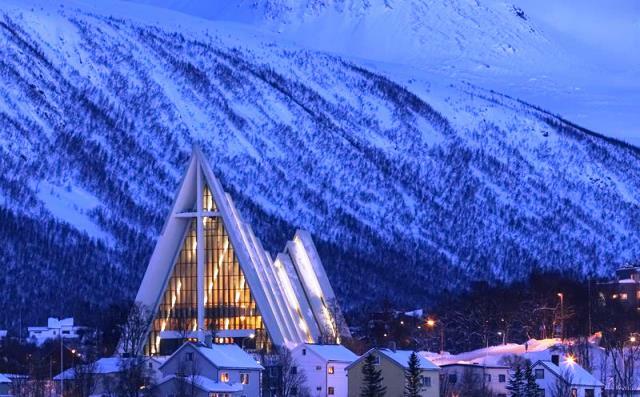 In 1952 author Dore Ogrizek wrote of Tromsø¸ “The place is alive with a motley crowd, among which may be seen many Lapps in their traditional dress – high boots and square cap rather reminiscent of that worn by Oxford dons.”Scandinavia. You may not see many Lapps in traditional dress today, but it’s definitely alive and the motley crowd consists of tourists as well as locals, all adding to the unique international mix that makes up this special Norwegian town. Thanks for bringing back some happy memories especially of that midnight concert… a magical moment, as was waking up to a fabulous sunny morning with the town still covered in snow. Northern Norway is truly beautiful. Thanks for sharing this post. Glad you enjoyed it. This part of Europe is exceptionally beautiful and well-worth adding to anyone’s bucket list. 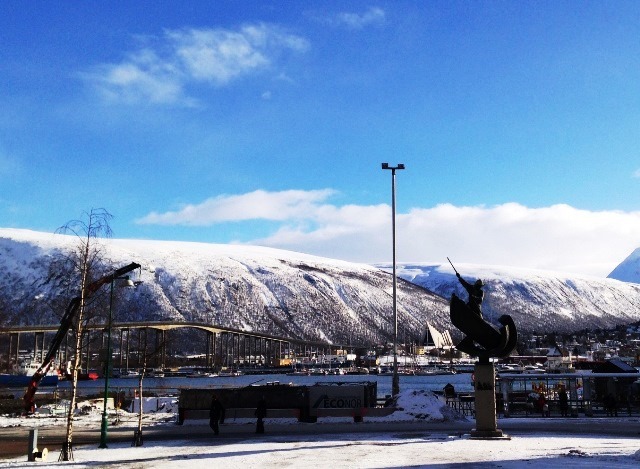 The 4th spectacular thing to do in Tromso is…. to run in the annual Tromso Midnight Sun Marathon. It starts on 21 June, 8:30 PM and continues until well past midnight, depending on how fast you are. I did in in 2010. Unforgetable. 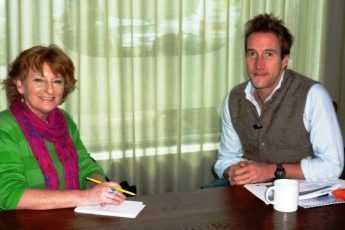 That’s a big challenge Iris – good for you doing it in such a northerly city! Sauruses invade Blackpool – Showzam!